I get so tired of sitting. I'm at work from about 7 to 4 or 4:30 every day, and spent the majority of it sitting. I then come home and most evenings spent MORE time sitting, either doing homework or working on blog posts. There are days I literally feel like the imprint of the chair is being forever burned into the back of my legs. NO MORE SITTING! To compensate, I try to get out and walk during lunch when my schedule and the weather allow. Then when I get home, before I settle in and get back on the computer, I typically go for a walk around our neighborhood. Sometimes it's no more than 10 minutes, but it's enough to clear my brain and make me feel like less of a sloth. Ideally, however, I go for a long, leisurely walk after work. I prefer to go with Ryan, but if he's busy, my iphone usually accompanies me (and now I'm rolling my eyes because, really?! Take a break from technology already!). What does sitting and walks have to do with these sandwiches? They are fast. Come together in fifteen minutes fast, which means I can go for that leisurely walk after work and not have to worry about rushing to get dinner on the table before Ryan heads off to class. Although the ease of making them is enough to make them a favorite in my book, I have to say Ryan and I both loved these. There was audible "mmm-ing" coming from our patio the evening we ate these. 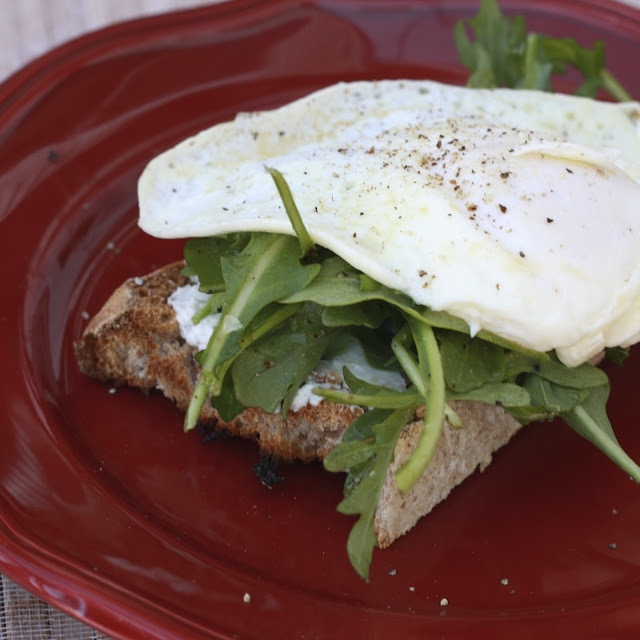 Granted, we've yet to dislike anything we've topped with a fried egg, but the combination of flavors was just perfect. I loved the bright flavor that the lemon and thyme gave to the goat cheese (my adaptation--the original had ricotta) and the peppery arugula was a nice complement. Served with fruit or salad or even a soup on the side, these make a wonderful (fast!) meal...leaving plenty of time to be out and about doing other things! 1. Place bread on a baking sheet and toast in toaster oven or under the broiler until lightly toasted. 2. In a small bowl, toss together arugula, 2 tsp olive oil, 1/8 tsp salt, and 1/4 tsp salt. Set aside. 3. Heat remaining 1 tsp oil in a large nonstick skillet over medium heat. Cook eggs until whites are set and yolks are still runny. 4. In a small bowl, combine goat cheese, Parmesan, and thyme. Add a squeeze of lemon juice. Spread mixture evenly over each bread slice. 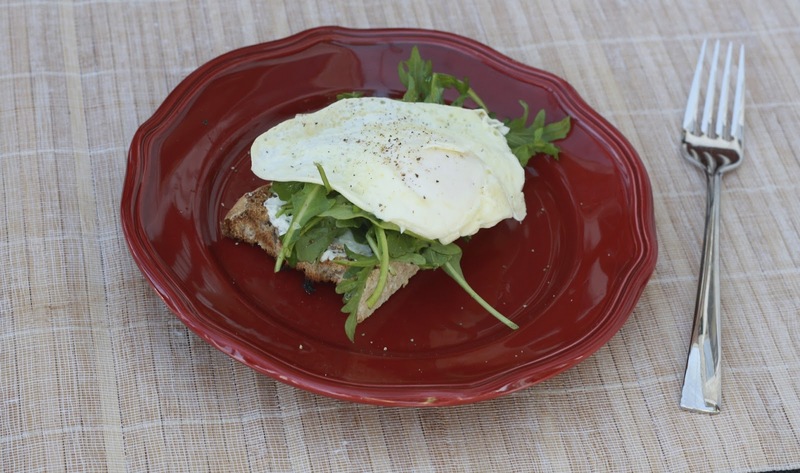 Divide salad and eggs evenly over bread. Sprinkle with salt and pepper before serving.